I’m having a lazy day today. All I have managed to do is make the bed. Went for a walk with K and Mr Benny to have a coffee down the street. Not much else. I’ve got a list of things that I should be doing but my mind and body are at odds. Plus the things I should be doing are very low in the interest factor. They involve paperwork. I have uploaded a photo. When my niece moved in with us prior to Christmas last year I had to make a lot of decisions about getting rid of stuff to make room for her in the house. Apart from a lot of my son’s toys and games I decided to throw out a most hideous painting I did ages ago. I KNOW it is hideous and certainly don’t mind confessing to it. After K dropped it off I asked him to go back and take a photo of it. It just looked so funny sitting there. Often I walk past charity shops and there will be some awful painting in the window for sale. Some bush scene with a cow in it. Or a cabin by a stream. I look at them and know exactly how they got there. 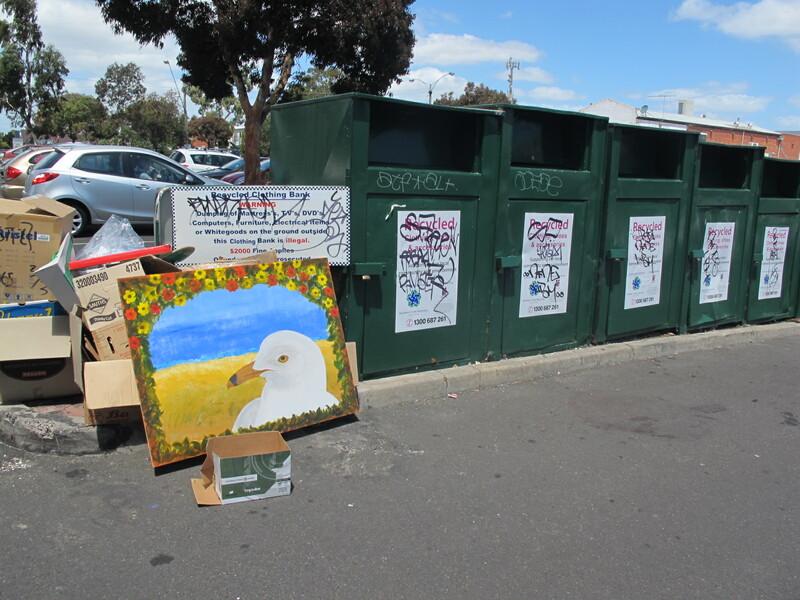 Now I wonder if my seagull painting ever turned up in the window of a charity shop. Someone would have walked by and laughed at it just as I have laughed at other people’s work. Not laughing in an unkind way. It’s just funny. I can’t imagine anyone bought it. But I can imagine somebody laughed at it. I thought the colours in the seagull panting were brilliant! Thanks Ms DF. The colours were very bright and in the right place (not the charity shop) it might have worked. A little beach hut or something. The seagull looked psycho. I know I had issues with it so sending it off was not too hard. The seagull painting was probably picked up by some discerning art collector, and it will sell for 2.5 million dollars after your death in the distant future! I actually like the seagull painting! Too bad I was too far away to but it from you. 🙂 I'm not kidding about liking it. Maybe I enjoy a psycho gull? I do understand needing to “clear” stuff out and if YOU didn't like it, that's what mattered. Yes, I can see that happening. I did sign my name just in case. In the right place he would work. He had his own staring charm. I think, in fact I know, I was not in a good frame of mind when I did it – maybe I can see that in his eyes. Awww I liked the seagull. He was very festive with his flowers! He may well be now hanging on some wall. Staring at everyone.